It’s hard to imagine a better name change than Memoto transforming to Narrative. It’s the same company with the same product, a lifelogging camera, but the new name and brand opens up for a totally new story on the vision of what the company stands for. The camera that the company is starting to ship out in November this fall is a tiny, automatic camera that takes a new image every 30th second; we’re talking about a wearable camera able to create a continuous life log stream for the user. Just stuck it on your jacket or your shirt and then it will continue to take a new photo every half minute. Since the company started it was known as Memoto. But during 2013 it became clear that the name violated already existing similar trademarks. So a name change was inevitably. Forced to find out a new name the crew behind Memoto came up with Narrative and a better change of brand is hard to imagine. 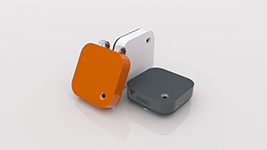 With Memoto the thoughts goes to memory, to keep the episodes of your life to yourself. With Narrative the thoughts goes to storytelling, to share the episodes of your life with someone else. That gives the automatic lifelogging camera a whole new aura. It’s all about sharing, it’s all about the need to lift up parts of your life and show it to others. With Memoto it was more of registering people who comes up in front of you. With Narrative it’s more about being part of a community. And that is something completely different. New York City’s Chief Digital Officer Rachel Haot, @rachelhaot, will hold the opening speech at The Next Web Conference today in New York. And yesterday, she was busy launching the new website for New York City. The new role as a Chief Digital Officer is becoming increasingly common in organizations alongside the CIO’s traditional role when it comes down to executing a digital strategy. The challenge of this new role is to drive change from traditional analog business processes to more digital where mobile applications, social media and virtual solutions are central to communication and business development. From a European perspective I do wonder if this is not a role that more cities would benefit from setting up. Why not Umeå, the European Capital of Cultural 2014? The trend is more and more obvious. We are heading for a time when everybody can be an app developer. Dutch startup AppMachine have seen this and are coming up with a solution and this week attending The Next Web Conference in New York. AppMachine describe their service as a ´Wordpress for App making´, with a promise that their solution may disrupt the app making industry. AppMachine empowers people to create professional native apps for iOs and Android smartphones, without the need of coding skills. Under the flag of Do It Yourself-movement it could give a tool for everyone who needs an app but think it´s too expensive to shuffle away 5000 dollars or more for having an expert making it. After two years of development in stealth modus this startup launched four months ago. Today they already have 44,000 active users and growing with 1,000 a week. As they attend TNW conference this week AppMachine announces to set foot across the Atlantic. AppMachine is growing rapidly with offices in Brazil and Germany and is seeking local US partners to conquer the US market. The company has just been nominated for the Deloitte Rising Star Award 2013 as one of the young highly promising technology companies. But ApMachine is not the only player in this field. Another competitor is SATIN, a prototype toolkit made in Sweden for development of mobile services. Like AppMachine It makes it possible to easily create your own app, even without prior experience of programming. You design web applications using a graphical interface and get started in minutes. After WordPress that made it possible for everyone to start their own blog and paper.li to start their own magazine this is a natural development. Do It Yourself is coming to the world of apps. Let us state: Computer scientists are crucial for today’s complex structured trade finance market. Without their skills Financial IT would not exist. The systems that provide stock exchanges and financial clearing houses must never go down and they are sometimes compared to the rigorous scrutiny that control power plants and fighter jets. One of the companies at the intersection of these inancial IT systems, big data and social media is the New York-based startup company Dataminr. Dataminr has developed a method that allows information to be retrieved in real time from the huge amount of data that Twitter generates. Diving deep into this data with data mining methods Dataminr is capable finding patterns and structures that can be combined to rapid analyzes of the hot new trends that may affect financial trading. In order to really dig deep into all Twitter updates Dataminr have managed to get a strategic partnership with Twitter, which means that they have direct access to information in the Twitter’s servers in real time. The method has attracted great interest among banks and financial institutions as an additional tool they can use to take decisions based on movements in financial markets. In an article on The Next Web Dataminr is hailed as one of the 50 hottest startup companies in New York. The company also attracts investors, $ 30 million has been received this fall in fresh venture capital. In order to develop the tools and methods that Dataminr use to detect patterns in Twitter updates they need to build up a professional team of computer scientists and mathematicians. This is evident in the job ads Dataminr publishes. As of this writing Dataminr are looking for ”dedicated data scientists” to sort, analyze and deliver relevant information from the huge amount, we’re talking terabytes, of unstructured data generated by Twitter updates. The formal requirements are a Ph.D. in computer science, mathematics or statistics, and at least five years of experience working with advanced data mining, statistical analysis and machine learning. The importance of computer scientists in financial IT is stressed also by Tomas Forsberg from the Swedish company Cinnober when he recently at a lunch lecture with students in Computing Science at Umeå University told that computer scientists and software developers are key holders for the entire financial industry. Cinnober develops solutions for demanding trading and clearing venues. Exchanges and clearinghouse worldwide are their customers from Thailand and Dubai to London, Brazil and other international hot financial metropolises. “We are constantly working with risk management and stability. Operational safety is important and real-time monitoring is a requirement”, says Tomas Forsberg. With experience of analysis and risk management in financial trading and development of the systems internationally major exchanges use to manage their large data sets, Tomas Forsberg has a deep understanding of the important role that computer scientists play in financial IT. “You are those who can answer questions about how the systems will be built”, says Tomas Forsberg supporting the students to take their first steps into the realm of financial it. Mattias Lidman is one of many talented computer scientists who have graduated from Umeå University. Today, he is researcher at the Computation Institute of Chicago. In his student thesis, he addressed the same question as Dataminr – is it possible that from the surging Twitter stream do analyzes of trends in the financial market and share trading? It is, showed Mattias Lidman in his thesis ”Social media as a Leading Indicator of Markets and Predictor of Voting Patterns.” In this paper he shows how the flow of information from social media, primarily Twitter, can be used to predict market trends and to predict how the price of the shares will rise or fall. To get the most accurate picture of reality as possible Mattias Lidman chose to take on the entire Twitter stream where retweets and spam filtered away. The result was based on unique hits written by people who have an opinion and who are familiar with stock trading. Using a statistical analysis and filtering, Mattias has caught up with posts that mention the stock symbols for example IT companies like Intel, Google and Apple. To handle the Twitter stream required an automated approach. Millions of different correlations between the values in updates and stock symbols make it impossible to follow it manually. These three examples from Dataminr , Cinnober and researcher Mattias Lidman indicates the importance of computer scientists today for financial IT and financial trading. It also gives a hint to universities that financial it is a quest also for education in computer science. But shouldn’t that robot have some clothes on when it’s so cold outside? At least a jacket? We are heading out from Café Station in Umeå where Helena Lindgren just has held a lunchtime lecture on her research into robots. With her on the stage, she has had Neja, half a meter tall robot that during the lecture sits beside her in an armchair. Neja looks like a little child, with a head that can turn from side to side, eyes shining, a mouth that speaks, and she even dance with her arms and legs. During the lecture, Helena Lindgren has told us about her work as a research leader at the Department of Computing Science at Umeå University and how she and her research group examines how the robot should be able to understand what is important in meeting with people and how to adapt to people’s everyday lives. This requires smart systems and actually it is these systems that are interesting, not how the little robot can wiggle her head or dance with her foot. 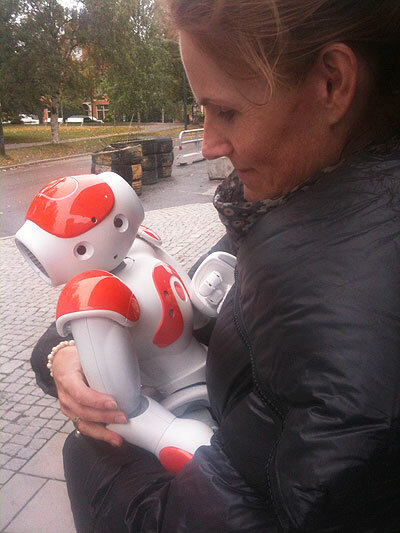 The challenge, says Helena Lindgren, is to build knowledge systems that control the robot. For it is not the robot that is smart, it is the information system that controls the robot which is smart. The vision of the robot is that it can be placed in people’s homes and help perhaps elderly or sick receive support in their daily lives. But then again, the intelligent system that controls the robot has to be able to understand the feelings of a person, and able to detect if the person becomes ill or what the person wants to do. But it’s not the robot which then makes a decision on how to react to what people in the surrounding area do. It is the intelligent system that does. It is in that system the smartness can be found. Slowly we who are listening to Helena Lindgren understands. It is not just this robot Neja. Everything in society is linked to various smart intelligent systems. Traffic surveillance that helps to reduce trafic jams. Smart homes that can save energy with intelligent systems controlling the heat and power. Automation and sensors in smart systems in the factories that control processes and production. In the business world there is even a word for this. It’s called business intelligence with smart systems that can understand the movements of the market and provide support for decisions that a company must take, sometimes even without anyone within the company needs to react, it goes automatically. When we begin to understand the scale of this, we face the next big question. Who should have control over these intelligent systems? Who makes the decisions on how they are designed and what information they should be fed. The little robot Neja turns out to be something even more than just a sweet little friend. She is the visible representation of the smart system behind. Inside her bright twinkling eyes, we can find systems that will steer the development of our society.We need to talk more about these intelligent smart systems. Yes! Thats right! 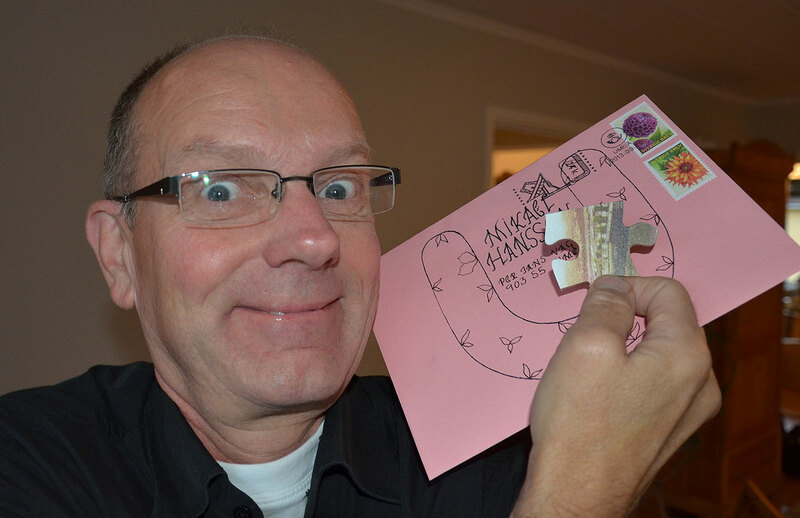 I just moved all of my previous blogging on this site to my Swedish blog blogg.vk.se/mikael. On this blogg you will find articles only in English. Yes, thats me. Coming up with my piece of the puzzle. Well, the puzzle of understanding how Internet and new media are changing our every day life into digital landscapes.